An additional 1 million people will be living with more than 1 serious long-term, life-threatening condition by 2025 – costing the NHS up to £1.2 billion a year, new analysis by the Royal College of General Practitioners (RCGP) has revealed. The College forecasts that if current trends continue, it will be 65 years before the share of the NHS budget for general practice – where the majority of patients are cared for – creeps back to the levels of a decade ago, when multi-morbidities such as cancer and diabetes were nowhere near as prevalent. Speaking to more than 2,000 delegates at the RCGP conference, Chair Dr Maureen Baker outlined a paradoxical situation where delivering complex care to patients with chronic conditions is most cost-effective in general practice – yet the bulk of NHS money continues to go into hospital care. Currently 90% of NHS patient contacts are made in general practice, yet the share of the NHS budget general practice receives stands at 8.33% (England – 8.45%), and the GP workforce over the past five years has remained relatively stagnant. Praising the work of GPs, Dr Baker explained how work carried out in general practice is helping people to live longer than they would have done in the past. She said: "They [patients] might be living into their 70s, 80s and beyond, and would almost certainly be coping with one, two, three or more long-term conditions. "It is a great testament to modern medicine that nowadays we are much more likely to prevent or treat diseases that in the past killed people so early in their lives. GPs have played a pivotal role in this transformation. Dr Baker then called for change: "We need an NHS that's properly set up to meet the complex clinical needs of people in the 21st century. "We need an NHS that can achieve this in a cost-effective way, supporting people to stay out of hospital and live as independently as possible. "And we need an NHS that is caring and person-centred, because we know that clinical need so often overlaps with psychological and social factors. "We all know what this is – it's called general practice!" 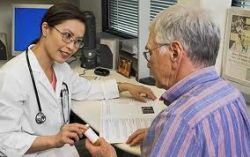 GPs and practice teams make 370 million patient consultations a year – 60 million more than just 5 years ago – indicative of the UK’s growing and ageing population and the sharp rise in patients presenting with multiple, long-term conditions. Dr Baker renewed the College's call for a 'new deal' and a 'real deal' for general practice in future, and criticised the government’s desire for 7-day working as “living in cloud cuckoo land” and a “recipe for disaster” with current resources. "Mr Hunt you say 'new deal', but my message to you and Mr Cameron is this... If you don't shore up existing GP care as your top priority, not only will you not get a 7-day service, but you won't have a 5-day service either – because you will have completely decimated general practice." Freedom to innovate – with a focus on promoting GP-led new models of care.